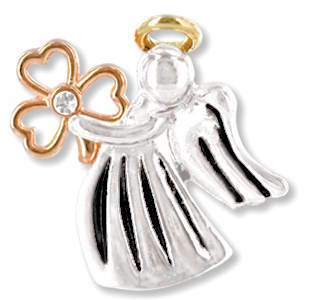 May this Irish angel Protect you each day and make its special shamrock, Bless you in every way. all of the pins were just as they appeared in the online catalog: however, the angel holding the heart....the heart had broken off. I was able to glue it back on and it is holding so far. I will definitely shop on your site in the future,I just wanted you to know how fragile they can be even when in their own little box.